Femulate: Don't sweat the small stuff! 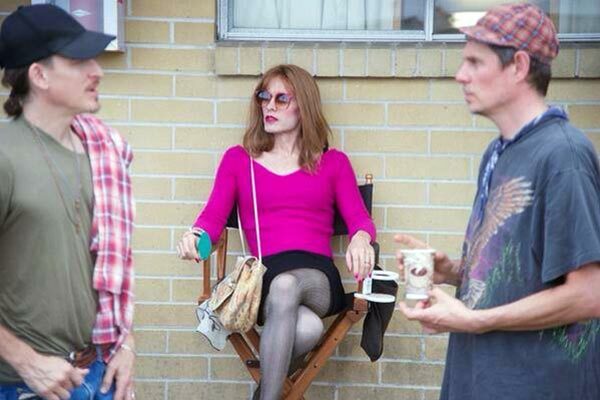 Jared Leto femulates in the 2013 film Dallas Buyers Club. The transgender community is up in arms again because a cisgender male actor is playing a transgender woman in some new film. “Why wasn’t a transgender actress selected to play the role?” they demand ask. They don’t call it “acting” for nothing. I say choose the best person for the job. Can you imagine if the trans community’s argument was used across the board? - Hire a royal to portray King George VI in the The King's Speech. - Hire a general to portray General Patton in Patton. - Hire a psychopath to portray Hannibal Lecter in The Silence of the Lambs. Did gays get where they are today by complaining when straights portrayed gays in films? It is trivial stuff like this that makes us look childish and just gives the “normals” another excuse to keep us down. 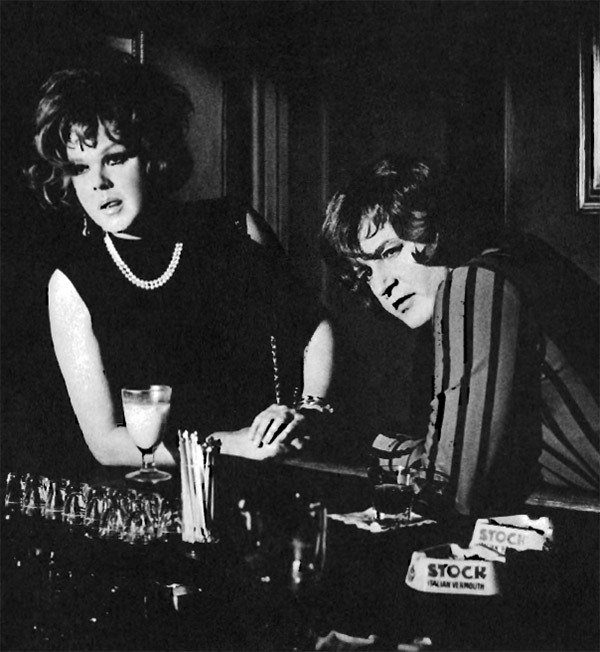 Kim August and Rod Steiger femulate in the 1968 film No Way to Treat a Lady. Stana, I have to agree with Jen Richards here. The fact that Hollywood keeps casting men in trans roles is dangerous. It reinforces the stereotype that all trans women are simply men playing a role. With conservatives jumping all over the 143 page report by Paul McHugh and Lawrence Mayer twisting other peoples research to say transgender people don't exist, that we simply choose to be trans, we don't need Hollywood casting cisgender men reinforcing the idea our lives are performative instead of reality. And when men see us just as men choosing "a bad lifestyle" this puts those of us transitioning in danger. The other point Jen was making is the limited trans roles in media. Sure Scott Turner Schofield is on a daytime soap and two trans people had bit parts in The Danish Girl but in general trans people aren't considered for even trans roles. In fact, Jen Richards auditioned for another part in "Anything" but was told she "didn't look trans enough." A trans woman doesn't look trans enough but a cisgender man does? Please! So on this, we'll just have to agree to disagree. I think it depends. If the cismale actor doesn't do a very good job of it his acting CV will not be the better for taking the part. History of the cinema has a long list of actors who play the roles of women and require much tolerance from the audience - hence why many trans roles are for comedy and silly ideas like trying to escape or hide away. If a trans actor is offered the role and does a magnificent job of it then everyone wins. However, just because you are trans doesn't mean you look any good, behave well enough as a woman or can even act to a required standard. So a bit of a dilemma for all concerned. The only trans roles in films as far as I can see are for males playing the part a male who enjoys cross-dressing and being trans. He then just tries to be the best woman possible which means he should have some real life coaching leading up to taking the part. If you are post operative and now a female then you just take your chances in the acting profession along with all the other female actresses out there. Anyway, is the film any good? There are more important issues then roles in movies facing-our community. I feel that this type of controversy makes transgender people appear difficult to work with. Eddie Redmayne was selected for his role in the Danish Girl because of his star power at the box office, and his acting ability. Why pick Tom Hanks or De Niro there are tons of poor actors out there who could use the break? Because if I pick them I will make money and get a return for my investors. I have been transgender for 50 years, before the word was even used. However I get miffed when a 20 something transgender person calls me out because I use the word cross-dresser or one time used transgendered instead of the PC transgender. Some in the community can be ideologues and remind me right wing evangelicals in the narrow mind set. I will probably be called out as trans phobic for this post. However we are all different and have different experiences that shape our journey. It seems that respecting those differences in today's political attack climate isn't the norm. I see things the same way you do. I do not like identity politics nor do I favor special treatment for some over others. I believe every position should go to the most qualified individual. I agree with you and Pat Scales. I say Bravo (or Brava) to cis-male actors who play Trans roles intelligently and compassionately, like Jared Leto in DALLAS BUYERS CLUB or Lee Pace in SOLDIER'S GIRL. Lee says he's very proud to have played a transwoman in that film, and he learned a lot about Trans people and the difficulties they face. Some gay persons have a similar hetero-phobic view ... they don't want straight actors playing gay roles. But when an intelligent, talented, compassionate straight actor does a wonderful job playing a gay character, I applaud that. For example, about half of the gay characters (both male and female) in the groundbreaking QUEER AS FOLK TV series (both the original British and follow-up American) were played beautifully by straight actors. I'll add one more thing and then I'll go away. So the best person for the role? OK, let's suppose someone wants to make a movie about my Congressman here in Georgia, civil rights icon John Lewis and the producers/directors thought a white actor was the best person to play the role. If he's the best actor for the job, he should get the role, right? And, just as trans people shouldn't complain about cisgender people getting trans roles, no African-American people should complain about a white actor getting the role? I realize that mine is a made up situation but it's the same argument and that just doesn't work for me. I normally don't comment here, however this time I can't just set back and watch. Having a cis-male actor playing a transgender role is wrong. Specially if the role is to in a comedy, we in the transgender community have had enough of Milton Beryl doing "Carmen", Flip Wilson doing "Geraldine", and far too much of RuPaul and what ever character he is choosing to do. Transgender women are NOT MEN IN DRAG! And having an actor that looks like a line backer from the local football team playing a transgender woman only adds to the stereotype that the studios have shown transgender women as for years. From the time of Christine Jorgensen to Renee Richards to the present day we have been thought of as clowns, murders, and perverts. And that is because of the fact that all we are ever seen as on television and in the movies is clowns, murders, and perverts. Hire transgender actors and actresses for movies where the character is transgender, and even for roles where the character is not transgender. As you say Stana, the actor needs to be a good actor. To emphasize, we call it acting for a reason. People that are type-cast do not usually suit a really good script, and that is the point for me. Because no actor can do a decent job portraying a character without a good story and script, I would argue that this is where the real issue is here. I want the writers and director and producer all to do their homework and make sure that our community is represented correctly, whether the character be transsexual, or cross-dresser or drag queen, or someone moving from one to the other, the character in that story needs to be authentic. The actor portraying the character then only has to be capable of doing their job; acting. As an actor, I agree - the best one for the role is best. If that IS a trans person, all the better.